Anyone can get an ear infection, but adults get them less often than children. 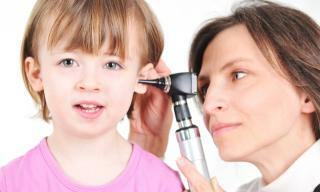 If ear infections are not promptly treated, they can cause complications. After you have discussed your symptoms with a medical professional, they will likely use a device to look at your eardrum called an otoscope to see if there are any signs of fluid buildup or infection. The goal of ear infection treatment is to rid the ear of infection before more serious complications arise. The recommended type of treatment for ear infections depends on what caused the infection. If the infection was caused by a virus, it will usually go away on its own. In this case, over-the-counter or prescription pain relievers or ear drops may be recommended to relieve discomfort. Acetaminophen and non-steroidal anti-inflammatory medicines like Advil, Aleve, and Motrin can help relieve pain and fever. If the infection is caused by bacteria, an antibiotic may be prescribed. There is a debate over whether or not to use antibiotics to treat ear infections due to the prevalence of antibiotic-resistant bacteria. Some physicians will only treat the symptoms of ear infections, while others use antibiotics to get rid of bacteria that may be hiding in the middle ear. If your child has recurring ear infections (3 or more in a 6 month period or 4 in a year), your medical professional may recommend more extensive treatment, such as long-term antibiotics, surgery to insert ear tubes, or, in some cases, surgery to remove the adenoids or tonsils. Ear infections may sometimes be treated with over-the-counter medication, but if you or your child is experiencing a fever, vomiting, or severe pain, visit a FastMed location near you to see a medical professional. We can provide you with the high quality treatment you need to get you relief in no time.